Who are the parties involved in import customs clearance formalities in New Zealand? Import cargo clearance in New Zealand Customs. What is the customs process in New Zealand to import? How is import cargo released from New Zealand Customs to importer? The information provided here details on how to import goods to New Zealand especially import customs clearance procedures in New Zealand. The New Zealand Customs Service is the government agency with the job of ensuring the security of our borders by protecting the economy from harmful imports and exports. As said earlier, register with the customs and apply for getting a client code. Trade Single Window (TSW) enables registered users to submit lodgements, view lodgements submitted on your behalf, and apply and manage client and supplier codes. You don't have to enroll for TSW Online on the off chance that you have a broker – they can apply for codes for you. Trade Single Window (TSW) gives options for submitting lodgements, including direct connection by means of electronic data interchange. All products brought into New Zealand for business or commercial uses should be cleared by presenting an import entry clearance or Electronic Cargo Information (ECI) form, if your import's free on board value is worth under NZ$1000. You can just lodge ECIs on the off chance that you use EDI programming. 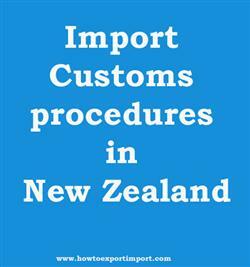 Import customs procedures required in AUCKLAND. Import Customs process in BLUFF. Process to import to CAMBRIDGE. Requirements of customs to import to CHRISTCHURCH. Customs requirements in DUNEDIN to import. Customs needed to import to INVERCARGILL. How can I clear customs to import in LYTTELTON. What Customs formalities required to import in NAPIER . What should I do to import goods in NELSON. How to get import customs permission in NEW PLYMOUTH. Procedure to get customs clearance to import in PORT CHALMERS. Mandatory process need to complete import in PORT PEGASUS. The way to get customs clearance process to import in Christchurch. How to import to India from Jordan? How to export from Jordan? How to export from India to Jordan?